But first, have you seen artificial intelligence (AI)? Or where is it in the products that you daily use? Let me cite two examples. You will have a smartphone. And there is artificial intelligence in it. Yes. You speak to your phone and ask it to do a task and it does. For this smart assistants like Google Assistant, Alexa, Siri or Bixby will help you. These assistants function with the help of artificial intelligence. Another example is you using Google maps for showing the direction to reach a place. You are shown the exact direction with the help of AI. Also when you call Uber cab, your exact price and car are matched by AI. This is really interesting. Economic Times report as of December 17, 2018 flashes a headline, “Over 4,000 artificial intelligence job roles vacant on talent shortage”. This means the companies are still searching for employees with proper training course in AI. Furthermore, this signifies that jobs for AI is growing. And the AI industry has grown by close to 30 percent in the last one year to USD 230 million. Moreover, your entry-level salary for AI starts from Rs 6 lakhs onwards. While 4 percentage of employees get Rs 50 lakhs per annum. This information creates a sense of urgency to log into a short-term course in Artificial Intelligence. The sooner you get a practical course in data science you can fill the lack of job talent in the industry. 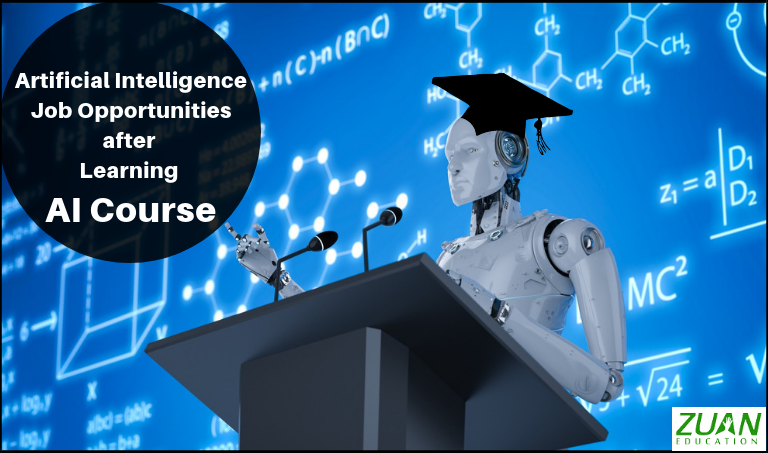 Significantly, there is another positive note to encourage you to learn artificial intelligence course. That is from 2019 onwards about 58 million new jobs will be created by Artificial Intelligence. Equally, many Indians were interested to apply for AI-related jobs between June 2016 – June 2018. Moreover, many particularly searched for the job role of Data Scientist followed by software engineer and machine learning engineer. AI career path has different job designations. Furthermore, years of experience in the field of AI and its trends will help you become a renowned global guest speaker. Let me take you through some job roles specifically. This is a key role among the artificial intelligence job opportunities. You will get an annual median salary of $114,856. Moreover, in this data science job you will be responsible for building and managing platforms for machine learning projects. Furthermore, you will be hired for this post if you have strong mathematical skills. Significantly, you will be required to have knowledge of machine learning, deep learning, and neural networks. Additionally, you should also demonstrate good computer programming skills, analytical skills, and experience with cloud applications. Robots can automate jobs but they need trained programmers to keep them functioning well. Moreover, Robotic science is used in space exploration, healthcare, security and in other scientific fields. A job in robotic science is the most craved among artificial intelligence job opportunities. Significantly, as a robotic scientist, you will build mechanical devices or robots that perform tasks at your command. Specifically, you will get a pay of Rs 488,065 per annum in India. This is the main job role that had maximum search for artificial intelligence job opportunities. Your role will be to collect, analyze and interpret large and complex datasets. You do this by using machine learning and predictive analytics. Furthermore, in the IT field, as a Data Scientist, you will earn an average salary of Rs 620,244 per year. As a research scientist, you will need to have multiple skills. For example skills in machine learning, computational statistics, and applied mathematics. However, you have to remember that this role is a promising one among artificial intelligence job opportunities. Significantly, as a research scientist you will earn a salary of ₹2,654,400 per annum. As a big data engineer, you will earn an average salary of Rs 784,713 per year. Your job will be to develop an ecosystem that enables business systems to communicate with each other and collate data. Moreover, You will be tasked to plan, design, and develop the big data environment on Hadoop and Spark systems. Artificial Intelligence and Robotics are fast developing trends in the field of business, jobs, daily use gadgets etc. Therefore, you have to make haste to fill the AI job vacancies in India. If not now then when? Opportunity is rightly knocking at your door. Furthermore, enroll in a private IT institute in your city or get more details about the AI course. Correspondingly, machines out there are waiting for you to program and command them! Best Wishes.